Sandip Ghattaure and Stephen Blackburn both work in Leeds City Council’s Open Data team. Their latest work is the release of the city’s WiFi data set. Sandip: As part of the open data team, my role is to liaise with services and partners, encouraging them to open up their varied amounts of data, at times this can be challenging, frustrating and interesting. One way of convincing services of how powerful their data is, is by presenting it in new ways. You often see these visualisations on news reports when they’re presenting stats or in performance reports. This style allows us to get the message across in a simple format and visually appealing way. I’ve been working with our ICT department on the public access WiFi dataset. This shows all existing council buildings and open spaces that provide free WiFi access as well as those which will in the near future. To make it more useful I added ward data and longitude and latitude – this now makes the data much more interesting! 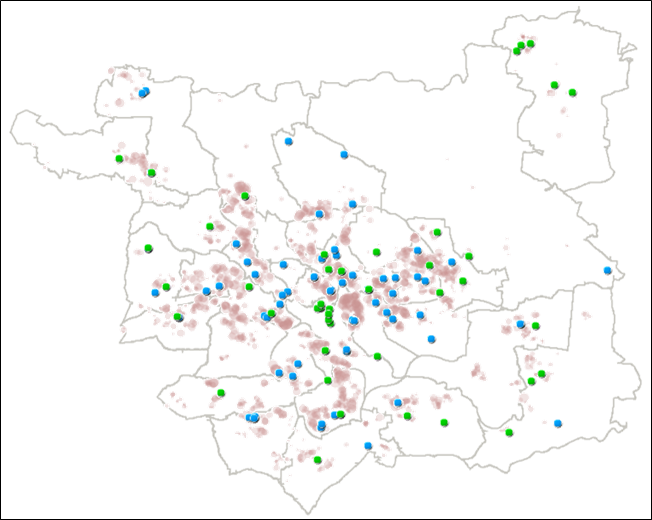 On top of a map of Leeds I overlaid the areas of ‘digital exclusion’ (red areas) and the locations of the buildings and open spaces where WiFi access is already available (green points) or imminent (blue points). I have also included the blue AQL free WiFi telephone boxes in the city centre. Stephen: The work Sandip has done shows brilliantly how the council’s new free WiFi points cover most of those areas deemed as digitally excluded. But what does digitally excluded actually mean? Well, cheap (or free) access to broadband is just part of the story. With a general move to all-things online, it’s important that we all feel comfortable using a computer, not least because accessing services online can save money! Great broadband coverage does not necessarily lead to everyone accessing services online. If some sections of society just aren’t happy using the web, there’s a potential that these people with inadvertently be excluded. The Leeds Data Mill is involved in some great work offering basic education classes to help up-skill citizens who have an interest in accessing the data stored on the platform. Soon, we’ll all be able to complete ‘challenges’ by accessing, manipulating, and analysing the data – another way of helping us all improve our IT skills. It is so important that everyone in our city not only has access to the right tools, but also the right skills to access an increasingly online world. Now it’s over to you, remember the points on Sandip’s map below just show the council buildings offering free WiFi. It would be great if we could collate a dataset to show to true picture of the city – supermarkets, coffee shops owners and retailers – email us at open.data@leeds.gov.uk where you’re offering free WiFi and let’s show just how connected Leeds really is!